We are privileged in this Great Lakes State of Michigan to host the Common Loon as it displays its stunning breeding plumage of black and white. Its distinctive calls announce the arrival of Spring to the North Country. 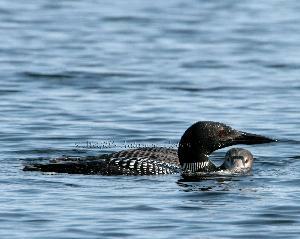 The Common Loon has sadly been prey to pollutants, lead posioning from fishing sinkers and high levels of mercury contaminats along with the lost of habitat. Seney National Wildlife Refuge in the Upper Peninsula of Michigan has one of the lowest levels of mercury in their pool system. 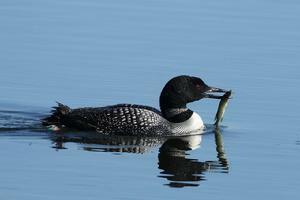 Therefore, the Common Loon population has flourished there in recent years. 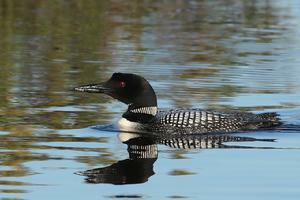 It is home to the oldest known loon, ABJ, which means adult banded juvenile. 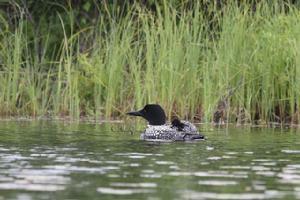 He was born in 1987, the first to be banded in an ongoing study of loons and thier migration patterns etc. 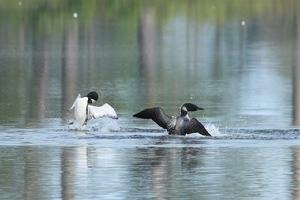 The photos above and below are of some of Seney's Common Loon population including ABJ on the right. 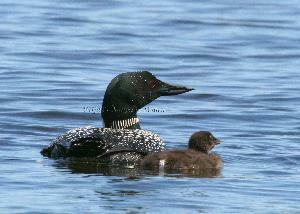 Common Loon can measure up to 3 feet in length and weigh up to 12 pounds, the male being the larger. 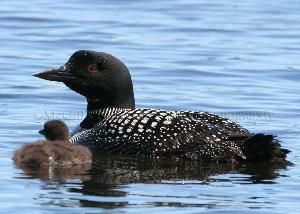 During breeding season the Common Loon has beautiful black and white plummage. It is predominately black with white checks on it's back, black head, white striped neck and white chest. The Common Loon's eye when photographed properly shows off it's amazing red color. 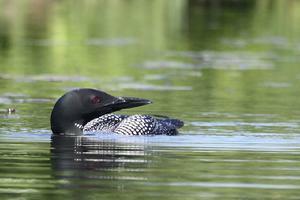 The Common Loon is a graceful swimmer. 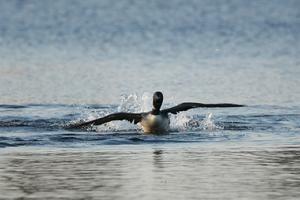 The position it maintains in the water is based on its attitude and awareness of danger or other intruding loons in the area. If it sits high in the water it is on alert. If it slinks really low in the water it is trying to not be seen. It can quickly dive and reappear many yards from where it dove at. They are superior divers catching its meal of fish or invertebrates. 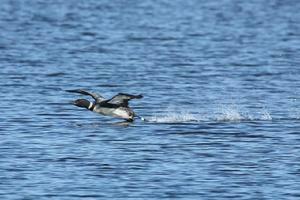 Due to the postioning of its feet located at the back of its body the Common Loon requires a minimum of one quarter of a mile of open water in or to takke off like the loon on the left is demonstrating. 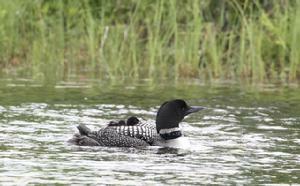 Note the "walking on water" of these three male Common Loons at Seney National Wildlife Refuge in the Upper Peninsula of Michigan. 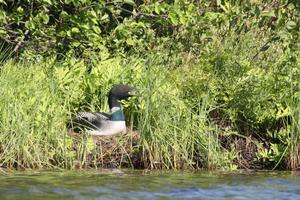 Common loons only access land when they are copulating and nesting. It is very awkward for them to maneuver on land. 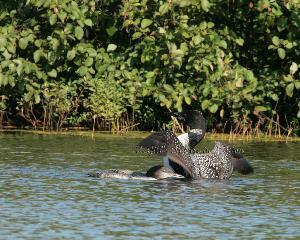 When landing the Common Loon first has to put its 'landing gear' down to help slow its flight. Once it gets low over the water the Common Loon needs to slow itself down by first dragging its foot in the water then descending on its belly as seen in the photos below. 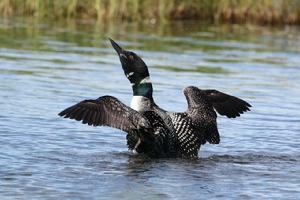 Cleaning and maintaining the condition of its feathers is high priority for the Common Loon. 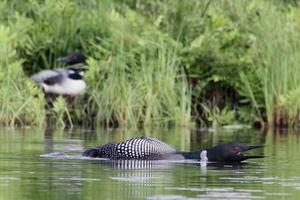 The McGills have observed loons showing their great dexterity while bathing. 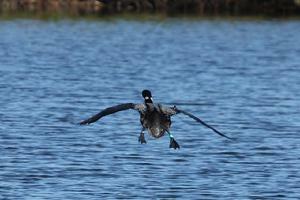 They will flipflop, 'rollover', smack the water hard with their wings, and basically look a little “loonie”. They do this to force the water into their feathers to eradicate dirt and parasites. 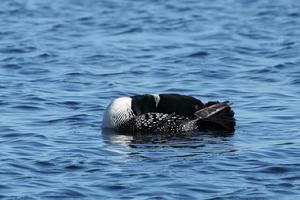 The Common Loon’s preening ritual involves extracting oil from the gland near the base of the tail and working the oil through all of the feathers. 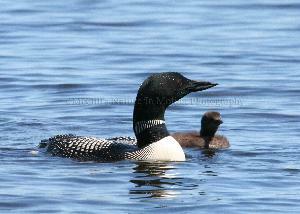 The Common Loon will rub its head on its back to waterproof its head feathers. 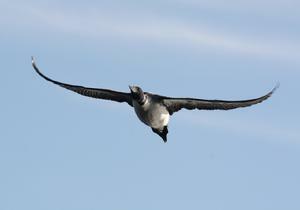 It also ‘zips’ its belly feathers making sure there is no air that can penetrate its skin. Since it spends most of its life on cold bodies of water, waterproofing its feathers it must to prevent hypothermia. 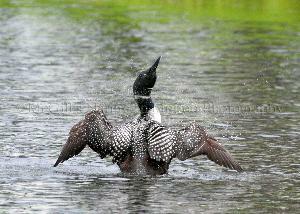 The Common Loon will then toss its head and flap its wings to extract the excess waters from its bathing ritual. The act makes for a beautiful photo op. LOL! 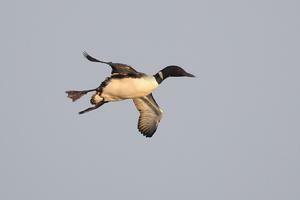 Another movement that Common Loons make often is the foot waggle. This is their way of regulating the temperature of their bodies. 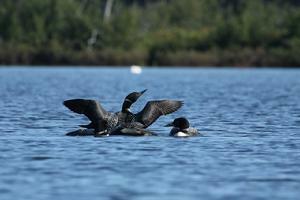 During breeding season the male Common Loon is the first to return to its former territory.The younger males try to win over the territory and the female who returns later in the season. 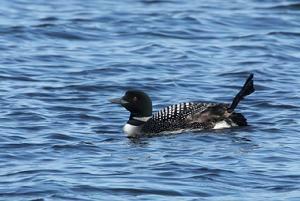 During this time is when the Common Loon makes the most out of its vocals. The yodel is the most aggressive of all their calls. 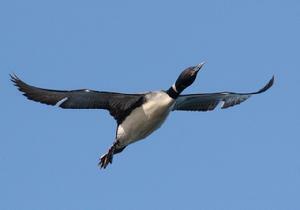 It is used to ward off danger or intruding loons. The male will extend its neck out in front of its body when using this call. The breeding pair once established is very aggressive at defending its territory. Females will also oust another female to claim a male and its territory. 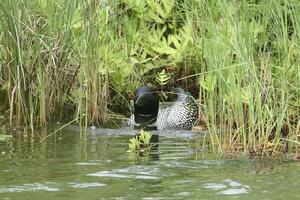 The Common Loon makes its nest of aquatic vegetation at the edge of small islands or projections of land near water. Once again due to the location of their feet at the back of their bodies the loon is not able to access land well so the closer to the water the better. 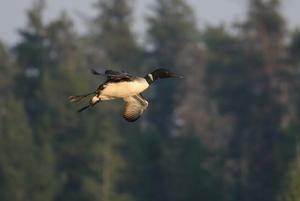 Some Common Loons use the floating nests that have been generously built and placed in areas where water levels and human habitat would have otherwised displaced them. 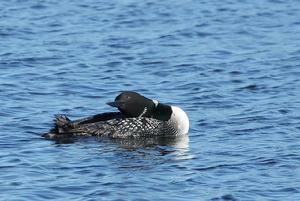 A pair of Common Loons generally incubate two eggs for twenty-eight to thirty days. The young leaves the nest and can float on water the day it is born. But because of its buoyancy the parents generally keep them on their backs till they can maneuver on their own usually at two weeks old. They can fly at around eleven weeks old. 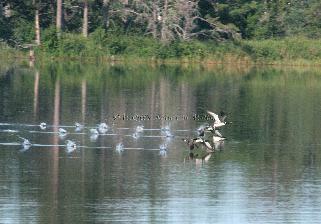 In years past Seney National Wildlife Refuge was been hit with a cold Spring and an abudance of black flies. This drives the parents off the nest for relief from the bugs thus exposing their eggs to the cold. 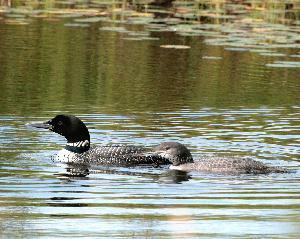 F Pool where ABJ the oldest known loon resides was the only active nest of young that survived within viewing range of visitors to Seney National Wildlife Refuge in 2008. Only six young were produced in 2008 far below the record 24 produced in 2007. Weather, elements and other wildlife are the enemies of the unhatched eggs. Also human interference can cause the parents to neglect their nests thus leaving the eggs exposed. 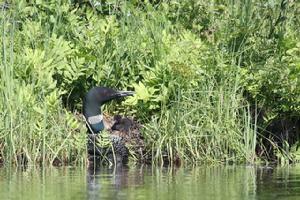 It is very important to give the common loon a wide berth when their are nesting. Water crafts even kayaks can cause the loons to abandon their nests. Caution is upmost important. 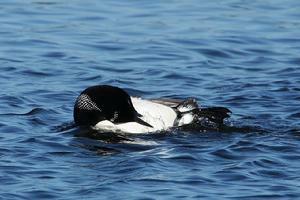 Some common loons are more skitterish than others and cannot tolerate intrusion. 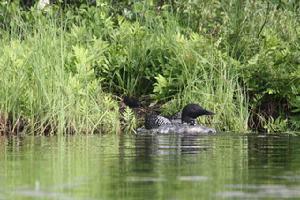 The Common Loons in the above four photos are of the E Pool parents at Seney National Wildlife Refuge with their young from a few years ago. 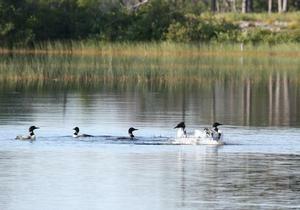 The McGills were allowed to bond with these Common Loons if for only a few hours. They shared their babies with the McGills who unobtursively sat within the brambles and bugs so as to not intimidate them. A year later their first nest was unsuccesful . The pair re-clutched in late June. The McGills were fortunate enough to see the babies when they were only a few day old. When the McGills returned in less than a week only one baby was left. The parents were diligently trying to feed the young. 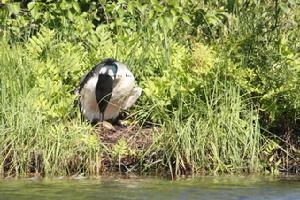 By the next day, it was confirmed by Damon McCormick, the resident loon specialist with Common Coast at Seney National Wildlife Refuge, that E Pool's second clutch was unsuccessful. It was so sad to see the parents and hear their mournful laments. Who says wildlife does not feel lose? The photos on the right above and on the left below are of ABJ the male parent on F Pool in Seney National Wildlife Refuge. 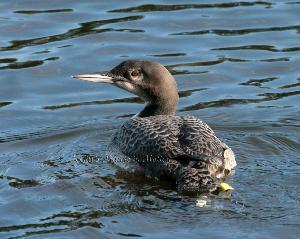 He is the oldest known Common Loon in the world at the age of 25. He was born on the Refuge and returned as is usual for the males at the age of three to its home to find a mate. He is the ideal parent staying with his young tll he was sure they could fend for themselves. Usually the parents leave the young by the end of August or first of September. The young stay until they are strong enough to fly off to their wintering location along the Atlantic from the Carolinas to Florida. ABJ kept watch over his two young, feeding them, showing them how to fish and fly. One young seemed to be more helphless than the other. ABJ was constantly feeding it and watching over it. By September 30th the McGills thought he was finally flying off. But, no, within fifteen minutes he was back to stay with his young. Damon said he would not leave them now till they were ready to fly with him, which he hoped would be soon for all of their sakes. ABJ and his two young all finally left the Refuge in mid October of that year. The McGills anxiously await the return of Spring and the calling of the Common Loon at Seney National Wildlife Refuge in the Upper Peninsula of Michigan. 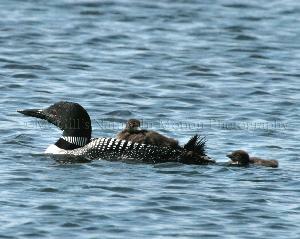 2010 was a great year for the McGill's filming and photograhing the Common Loons at Seney National Wildlife Refuge. 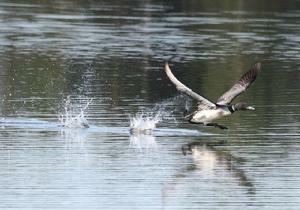 They had been following the pair on G Pool via the Fishing Loop. First was the making of the nest, next was a week by week updating of the pair as they shared nesting duty. The male was the one who spent more time on the nest. The 'changing of the guard" was awesome to watch. 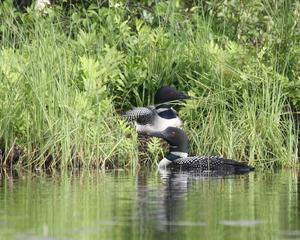 The one loon would slide off the nest as the other came to take its turn. It would laboriously climb on to the nest standing up on its feet. 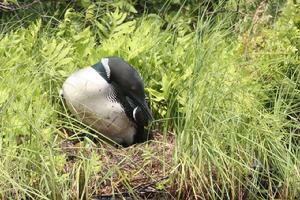 Once on the nest it would then turn each egg before settling in for several hours of tedious watching and waiting. The male started in yodeling as he came back to the nest area. The female was on the nest but acting fidgety. When the male came up to check on her, she decide it was time for her to have a break. 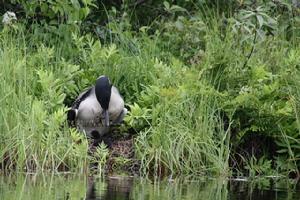 As soon as she moved off the nest, they could see a small still body. It appeared at first that it wasn�t alive. The pair started in with the Laugh call. They were very excited about the hatching of their baby. This was at 8:45 am. After watching the male take his turn on the nest they did see that the young was alive. YEAH!!! Mainly daddy on the nest incubating the second egg and mommy luring the first young out of the nest and finally into the water!!! How awesome this is!!! The McGills were so amazingly lucky to be able to not only witness this great event but to be able to capture it on film to share with others. SWEET!!! The first chick did not stay in the water the whole time. It did get back in the nest with daddy until mommy came back again. This time the little tike not only got in the water but ….on its mommy’s back!! Which of course is what everyone wants to see and film. TOTALLY AWESOME!!! Five hours after the first chick was hatched number two hatched! It was interesting to watch the parents' reaction to the second chicks birth. They were very hohum about it all. Poor little guy didn't get near the welcome that the first chick did. Typically, in humans as well as wildlife. LOL! After eleven hours in one spot, the McGills left the family with the young in the nest secure under daddy’s wings. As mommy floats off to de-stress. LOL! It will be hard for the McGills to top this day…if ever. 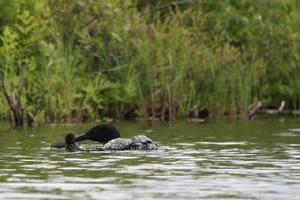 As the summer comes to a close and the rearing of the young is coming to an end, the Common Loons start to socialize. The will congregate on one pool, flying in and greeting their host and hostess. They point their heads down showing they are being social. 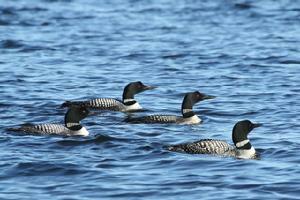 The common loons will float along as if on parade. Then all of a sudden they will start peering and diving. They like to show off to each other. They will belly swim along ‘laughing’ as they go. Then before you know it one will take off then another and another and so on. They will sometimes return and continue to party for up to three hours as the McGills have witnessed. 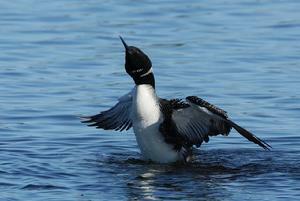 After a point the host loon will tire of the party and send ‘signals’ that the party is over. 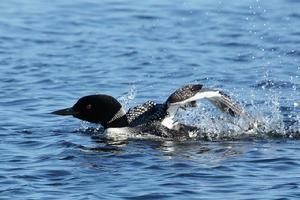 The loon will bolt out of the water. It will go into its yodel call, doing everything it can to chase off the, now, intruders. It is a totally amazing sight to witness. The females are the first to leave, usually in August. The males will tend the young a little longer before leaving in September. The young are then left on their own to, hopefully, fly out in October and into adulthood.